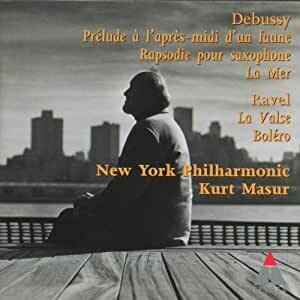 Stream Debussy & Ravel : Orchestral Works by Kurt Masur & New York Philharmonic Orchestra and tens of millions of other songs on all your devices with Amazon Music Unlimited. Exclusive discount for Prime members. 5.0 out of 5 starsBest "Faun..." ever! I can't review this album since it hasn't been sent to me. I ordered it on Nov. 30 and here it is Dec. 24. No album! The music may be good (Iwouldn't know0, but avoid ordering from New York Music and Movies. They can't handle it! No one thought that Kurt Masur would bring incandescent inspiration to the NY Phil. when he arrived in 1991, but he had a reputation as an orchestra builder, much needed after the laxness of the Zubin Mehta era, and he was an imposing presence, especially after the fight he led against the Communist regime in East Germany. It was humiliating for Masur that his contract was abruptly curtailed in 2002, but he had accomplished what was wanted. In addition, he was the last music director to bring a recording contract with him, even if it was another kind of humiliation that one of America's flagship orchestras -- and our national orchestra, really, under Bernstein -- had to turn to a German label. But Teldec stood by their commitments, churning out one CD after another that left critics cold because of Masur's dull proficiency, and sales slumped. I've revisited as many of these releases as I can find, and in this program of standard fare from Debussy and Ravel we hear the best and worst of what Masur could do. In L'apres midi the playing is lovely in all respects, showing off the delicacy of the Philharmonic's woodwinds and, of course, the solo flute. the saxophone playing in the Rapsodie is voluptuous (if you can't find a great sax in New York, well...). La mer is done with unusual warmth and smoothness; it rolls like caramel off the page. but one's attention has already begun to wander, because Masur has so little sympathy for the music. There is neither enough heart nor the thrill of sparkling virtuosity. This was the problem in disc after disc for the decade that Masur held tenure, and I must say that at the time I resented how he wasted the potential of a great orchestra, all the sadder after Bernstein died and no longer made guest appearances to resurrect his old band. As for the Ravel items, La valse is square, without a int of menace or slinkiness, and Bolero doesn't vamp. I had such high hopes in getting this CD. Being still somewhat new to classical music, I listen to associates for new ideas. Kurt Masur was recommended to me as a very good conductor and interpreter. With this in mind, when I bought this CD I hoped to be wowed. I wasn't. First let me just say boo to "La Valse". The ending just doesn't ignite like it's supposed to. Instead of the caustic ending I have grown to love I hear a bland ending without the Byronic element. Same with Bolero. The redeeming features of the CD are the Debussy pieces--and then only somewhat. Bottom line.....there are better recordings to buy. I am a professional flutist, and this is the best recording of Prelude a l'apres midi d'une faune that I have heard. Of course, Jeanne Baxtresser's performance (flute) is flawless and musical. The CD is very well recorded, and each piece is performed impeccably and with the highest artistry. In my opinion, this CD sets the standard for these works. Buy it!